87% of young executives say they would choose to work for a video-enabled organisation over a company that has not invested in video. 75% of senior executives watch work-related videos on business-related websites every week and that 59% of senior executives prefer to watch the video if both text and video are available on the same topic on the same page. Studies by consultancy Insivia.com show that adding video can improve your ability to remember concepts and details — with effects that can increase over time. Viewers retain 95% of a message when they watch it in a video compared to 10% when reading it in text. 90% of L&D teams are already using video. While we love nothing more than being brought in to create a high-budget drama or documentary, at the other end of the spectrum, lots of our clients are creating their own video content and we are supporting them to get the best from their teams with advice on kit, upskilling, processes and brand guidelines. One of the most powerful case studies of this kind of thing was shared at Learning Technologies back in 2016 by Ian Slater of GE Oil and Gas. Ian had rolled out a programme of user-generated video to “overcome training and quality horror”. His engineers and operatives were encouraged to film YouTube style tips about the kit they worked on and these were edited and shared via Totara. The result was a 60% reduction in the training base cost and 50% reduction in travel costs. They are now selling this video training to their lease partners and it is net profitable! 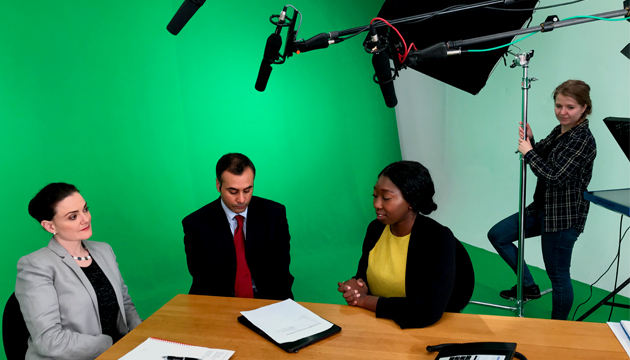 As successful as this project is, the Q&A revealed that they would have benefitted from consulting some video experts early on to ensure they had the most appropriate equipment and had sorted their storage and archiving processes. Video is a very simple and effective way to communicate a process. And even the most basic video has a pulling power, with many studies showing people more inclined to watch a video when invited than read text. We are all natural-born storytellers. When you interview someone for a talking head video they automatically summarise and re-order information to get a point across quickly and effectively. It’s storytelling – just turn on a camera and ask a question. Of course, as well as video of process and talking heads, in its more advanced forms video can have a lot more impact. It’s more like watching TV – with TV-style formatting such as news stories, personal stories, documentaries or maybe quiz formats. Other times we might kick off a course with what is effectively a marketing film. Perhaps the most entertaining video is drama. Take any idea and show how it could play out in the real world. Ideas lead to behaviours – lead to actions – lead to consequences. People can get hurt. Showing what happens when things go wrong makes you want to make things go right. Make it interactive and you can affect those changes as you watch. As well as stats, case studies and what we know from our experience as video experts, there are also theoretical arguments for the strengths of video. Dual coding theory suggests we learn through two cognitive systems: Verbal and nonverbal, and these two streams can be processed simultaneously. Because video engages both audio and visual channels, it can be a powerful and effective tool for learning. Danish educational theorist Knud Illeris believes that learning involves a subjective connection between the learner’s interests and motivations and the learning content, which always includes a cognitive, emotional and social dimension. Video, be it talking heads or drama, naturally lends itself to such connections. It’s clear how video fits in here. Video, especially personal stories and drama are powerful ways to create meaning and to make people care. The future of learning is in an emotional connection to the subject matter. Is video the future of learning? Josh Bersin, Forbes Contributor, corporate HR, talent management and leadership analyst says he’s seen the future of learning and it looks like TV! “Companies like IBM, Sears, and Visa are starting to turn off their old systems and build a new generation of learning infrastructure that looks more like a ‘learning network’ and less like a single integrated platform. While corporate compliance and mandatory training will never disappear, these are now becoming back-office functions, making the LMS far less strategic than it once was. To facilitate lifelong and point-of-need learning, users will access a library of bite-size learning through a Netflix-style interface from a variety of devices. Later he warned that keeping up may be impossible – who adapts will survive. Sounds like hard work, which we hope to make easier for you. If you want to learn more about the business case for video, ask us for a Discovery Workshop and get access to our Video Toolkit.